Why should you only enjoy your landscape during daylight hours? We create a warm and inviting ambiance surrounding your home with soft light, highlighting architecture, and focal points, while enhancing your landscape. Not only do we install, but our maintenance services and warranty offers our clients reassurance of our commitment to deliver the best service. Enjoy your outdoor living spaces safely after the sun goes down by adding the security of lighting at steps, built into walls, entertainment spaces, and pool areas; and shine gentle moonlight through your trees to cast a magical feeling on your property. We understand the need to protect your neighbors from light pollution and are able to carefully hide fixtures and point them towards specific points of interest. 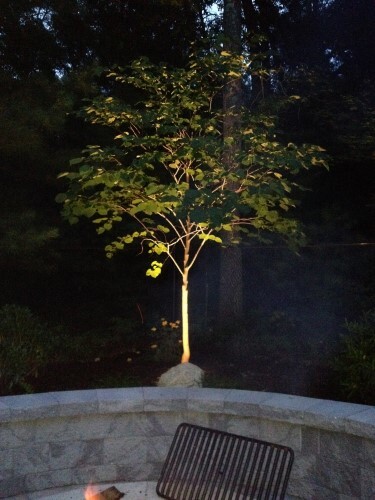 We can hide fixtures behind rocks and shrubs so you see the end result of the light, but not the fixture itself. We proudly service Wellesley, Weston, Franklin, Wrentham, Foxborough, Newton, Framingham, Natick, Ashland, Northbridge, Southbridge, Metro West, and more!